The Expedition 52 crew poses for a unique portrait. 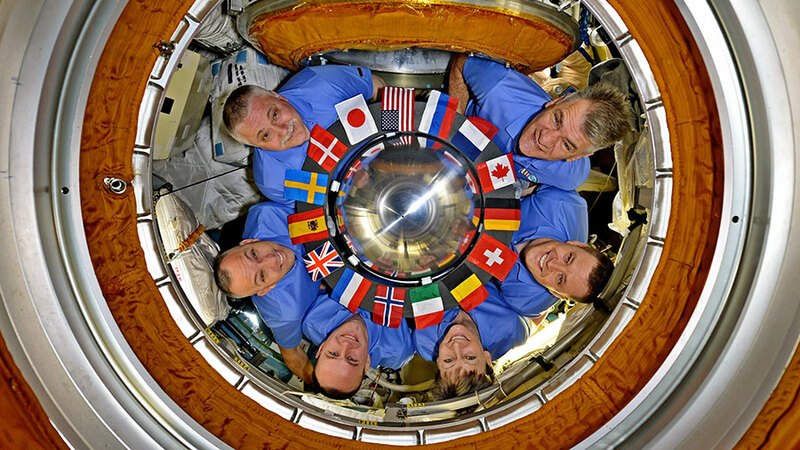 Pictured clockwise from top right are, Flight Engineers Paolo Nespoli, Jack Fischer, Peggy Whitson, Sergey Ryazanskiy, Randy Bresnik and Commander Fyodor Yurchikhin. The SpaceX Dragon is hauling advanced space research for delivery Wednesday morning to the International Space Station. Two cosmonauts are also gearing up for the seventh station spacewalk this year set to begin Thursday morning. Dragon is less than 24 hours from its approach and rendezvous with the space station for SpaceX’s third resupply mission this year. Astronauts Jack Fischer and Paolo Nespoli will be in the Cupola commanding the Canadarm2 robotic arm to grapple Dragon at 7 a.m. EDT Wednesday. NASA TV will begin live coverage of Dragon’s arrival at 5:30 a.m.
Dragon will stay open at the station’s Harmony module for a month of cargo swaps. The astronauts will offload new life science studies to improve therapies against Parkinson’s disease and explore ways to grow lung tissue as well as other research. A new pair of external experiments will also be deployed including a cosmic ray study to be installed outside of the Kibo lab module and a nanosatellite technology demonstration. Two cosmonauts are trying on their Orlan spacesuits today to ensure they are ready for Thursday morning’s spacewalk. Veteran spacewalkers Fyodor Yurchikhin and Sergey Ryazanskiy will exit the Pirs airlock at 10:45 a.m. for about six hours of science and maintenance work. Thursday’s spacewalk highlight will be when Ryazanskiy manually deploys five nanosatellites, including the first 3D printed CubeSat, into Earth orbit. So cool. I am in Tucson, AZ and we were able to see Space Station tonight and then all of a sudden we could see a light dot following after it and realized it had to be the Space X resupply ship. Wonderful to see. I worked for RSOC in 1980’s. Knew the Space greats and worked with a young Al Garcia and Herman Vargas. So proud of NASA and our space program. We were viewing the meteor at Red Rock Canyon in Las Vegas when we first spotted the space shuttle. Since that night we have been watching for it. It isn’t visible from our area again until Aug 28th, we will be watching. God’s speed!